There is a lot of history to be discovered in the great state of Arkansas. President Bill Clinton, the founder of Walmart Sam Walton, and the singer Johnny Cash all spent a large portion of their lives in this state. The economy in Arkansas is quite diverse, with industries in steel, poultry, aircraft, and tourism. For those planning to move to this state, there are several cities that rank nationally as some of the safest cities in the country. 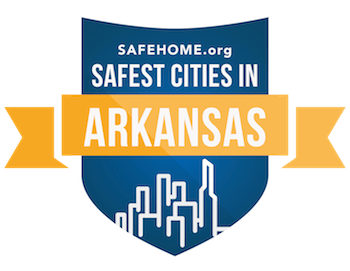 The top 25 safest cities in Arkansas range from 87.13 to 44.68, with a concentration of the safest cities being in the northwest corner of the state. Cities like Bella Vista and Bentonville are located there and have a safety score above 80, but there is another city near the center of the state called Cabot that has a safety rating above 80 as well. The rest of the top 25 safest cities on the list are spread out, with some being the suburbs of the state capital Little Rock, which itself has a safety rating of 46.58. Back to Bella Vista, one of the reasons it's the safest city in the state is due to its economy, it was primarily a summer resort town that became a retirement community. The city has been undergoing a lot of change in the past 10 years, including a rapid population growth of 60% in the past decade. Most of the residents here are in the tourism and hospitality industry, and older. Those who have a penchant for criminal behavior are not attracted to such a city. Property crime is amongst the lowest in the state, with only 216 incidents in a year compared to 520 in Cabot, a suburb of Little Rock with the same sized population. Just south of Bella Vista is Bentonville, the second safest city in the state with a population of 43,190. This city has the headquarters of Walmart, and therefore has a lot of jobs compared to surrounding areas, but is a small town at the same time. Therefore everyone is doing okay economically, and reduces the chances for crime, hence Bentonville having a high safety rating of 82.5. Around the state capital are some great suburbs like Cabot, Jacksonville, and Benton that all have a safety rating above 60.